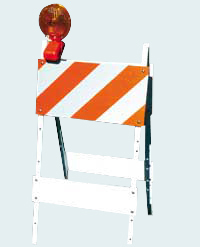 If you are in the market for traffic barricades but don’t know too much about them you have come to the right spot. First off, the type of barricade has to do with how many boards and/or pieces of sheeting a barricade has. Note: ‘sheeting’ is short for reflective sheeting, the orange and white striped piece you see on the barricade. The first barricade on the left is a type 1, the second a type 2 and the third one is the type 3.
but the board has no sheeting on it. A type 2 barricade has sheeting on both the top and bottom board of the barricade. 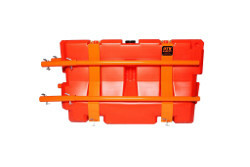 Like the type 1 it is the same size (24″ wide and 42-26″ high). The type 3 is a very different unit because it can range from 48″ to 144″+ in width. As you can see there are three boards, which command a lot more attention to the unit. 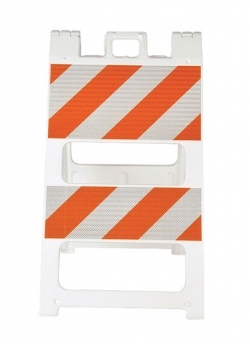 These are great for road closures where you need to cover wide distances. The sheeting is on all three of the boards typically. Now sheeting can have different types too. They range in the amount of reflectivity, starting with the lowest: Engineer Grade, Hi Intensity and Diamond Grade. For most instances Engineer Grade works fine. Jersey barriers are known as K-rail to the western US (California Department of Transportation came up with K-rail). They are either concrete or plastic barrier walls used during highway construction to separate opposing lanes of traffic. 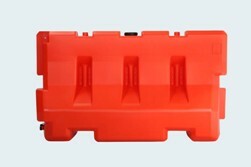 The barriers we sell are plastic water fill-able barriers. They are easier to ship than concrete barriers because they weigh a lot less. A typical jersey barrier is 32″ tall but lots are also 42″ tall. The first picture to the left is a 42 x 72″ water fill-able barrier. Jersey barriers were invented in New Jersey in the 1950’s at the Stevens Institute of Technology. The main goal of the barrier is to prevent head on collisions from the other lane when a vehicle goes off course. The official name for a 42″ tall barrier is an Ontario Tall Wall. The Ministry of Transportation in Ontario, Canada is replacing guardrails these these taller-jersey barriers on some 400-series highways. It is important to note that the first barrier pictured on the left is not approved for use on highways by the FHWA but the second barrier you see on the left is. It’s called an MB350 barrier and is actually safer than a concrete barrier in a crash. 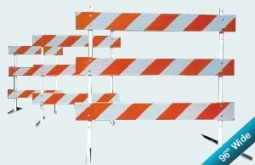 This barrier meets the TL3 compliance by FHWA when 33 barriers are interconnected in a row, and each barrier must be ballasted to equal 1,500lbs.